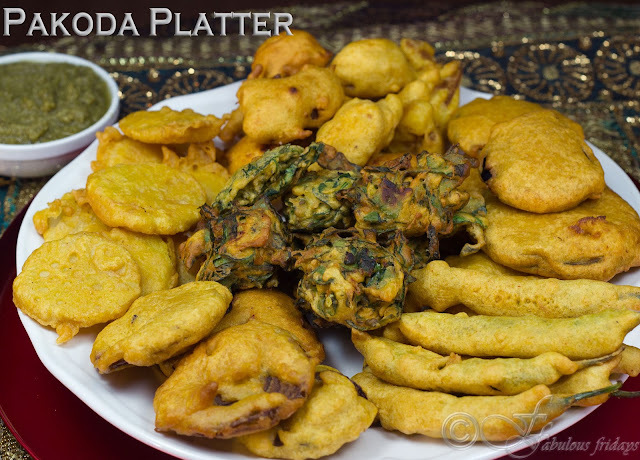 This tempting platter here is an assortment of fried pakodas (chick pea fritters). Small pieces of veggies are encased in a thick coating of chick pea flour batter, then deep fried till crisp. Known by many names pakoda, pakora, pakode this street food is served all across India. The vendors keep them half cooked ready to be crisped in hot oil and serve them in minutes with generous lashings of chutney. Its one of those guilty pleasures that lifts up your spirit on a dull, cold, foggy or rainy day. As kids this was a fave dinner for us during monsoon season rolled inside slices of bread. Crisp, hot tangy and delish accompanied with a hot cup of tea or coffee (whichever is your forte) is pure pleasure. By far my favorite is the mirchi pakoda and usually 1-2 are enough to satisfy my taste buds. 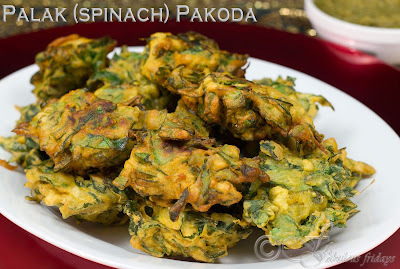 You can use almost anything you fancy to make pakodas - eggplant slices, cauliflower florets, slice of potato and onion, cubed paneer, chopped spinach or even a combination all of these chopped fine. 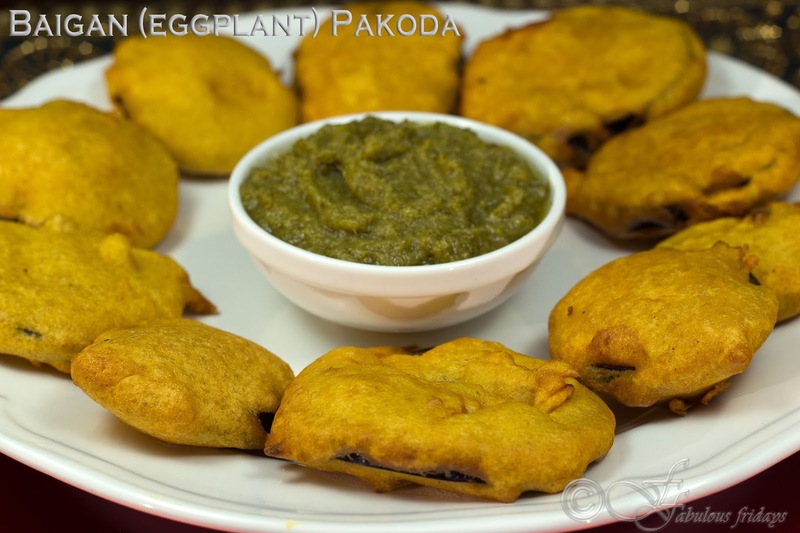 Bread pakoda is another variation where you can dip small triangles of bread in besan and make pakodas. 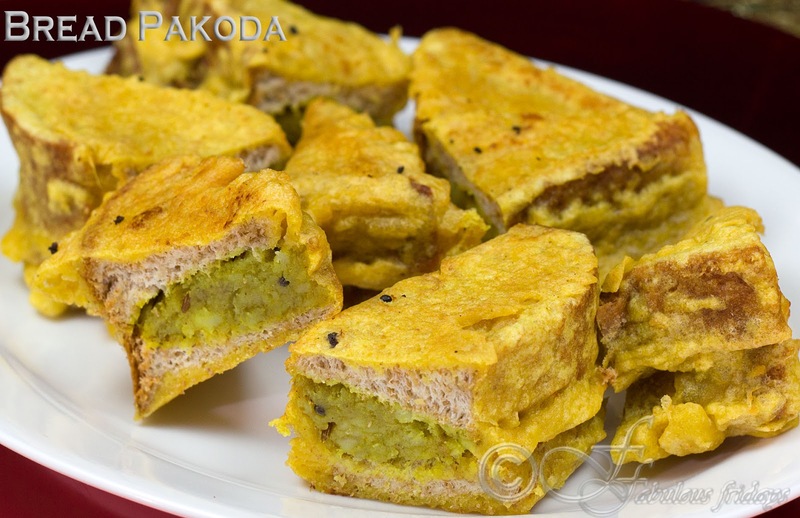 An elaborate variation of this is the stuffed bread pakoda. Encase spiced and cooked mashed potatoes between two slices of bread and then dip in batter to make pakoda. 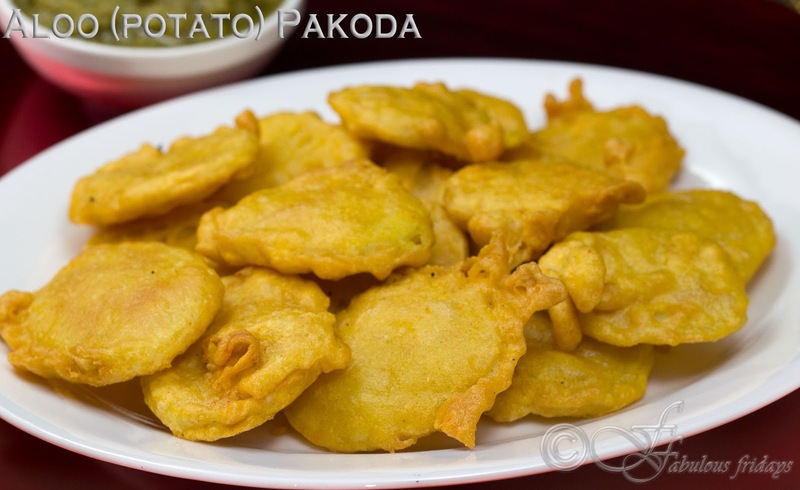 Whatever variation of pakodas you choose it is sure to delight your taste buds. Serve these as starters for your next party with one or more of mint chutney, mango mint chutney, garlic chili chutey and tamarind chutney. In a mixing bowl add the gram flour along with all other ingredients. Add water and whisk to make a smooth batter. You’re aiming for a thick batter, pancake batter sort of consistency to coat the veggies well. Heat oil in a wok or a deep pan for frying to medium high. Dip the sliced or diced veggies in the gram flour batter to coat and deep fry until golden brown and crisp all over. Drain on paper towel to remove excess oil. Serve hot with a chutney of your choice. 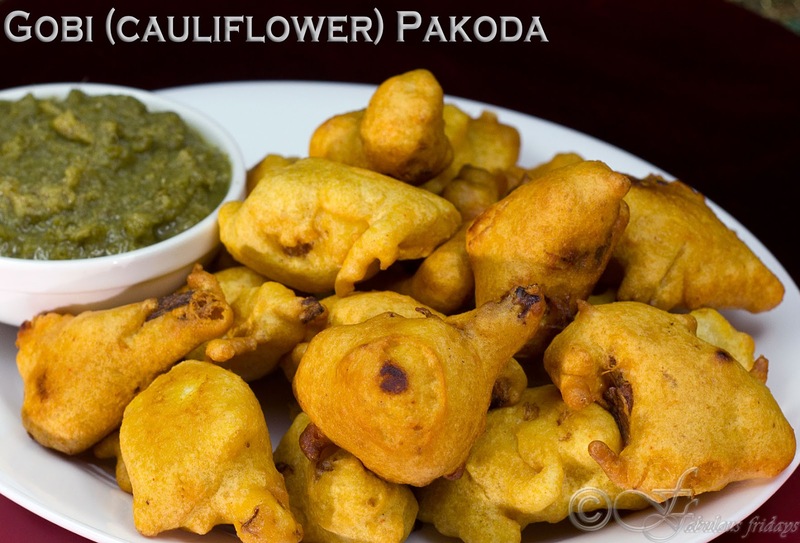 Here are some of the common vegetables used for making pakodas. You can choose others according to your taste. Some other ideas are paneer, broccoli, zucchini, mushrooms, etc. Procedure is the same as above. Just make sure to use green chilies that you can bite into comfortably. If the chilies are very hot then give it a slit and remove all the seeds. Sometimes I use small hot green chilies and usually one is enough to get the waterworks going. 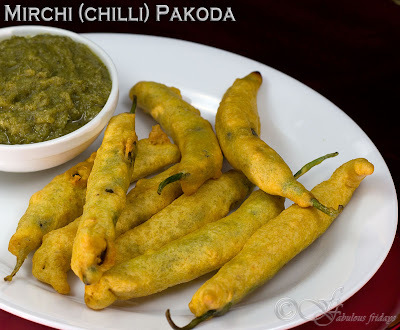 Use large green chilies, stuff them with mashed potato and then coat them with a thick batter and deep fry. Tastes awesome. 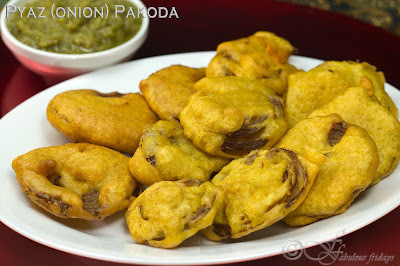 Baigan pakoda is one of the faves. The meaty texture of eggplant gives this one a wonderful bite. Use big eggplants for this and cut into even slices, about a quarter of an inch thick. Do not peel. Procedure same as above. Peel and slice onion into thin slices. Dip them in the batter and coat then well with the thick batter. Drop into hot oil and fry till crisp and golden. The steam build inside will lightly cook the onion. Proceed with the basic recipe for making the batter. Add chopped fresh spinach and green chili to the besan batter. Drop small spoonfuls into hot oil and fry till crisp and golden. As a variation you can add finely chopped onions, methi (fenugreek) and potato along with spinach and make mixed veg pakodas. Cut cauliflower into bite sized florets. Dip them in the batter and coat then well with the thick batter. Drop into oil at medium high heat and fry till crisp and golden. The steam build inside will cook the cauliflower florets tender crisp. Peel and slice potato into thin slices. Dip them in the batter and coat then well with the thick batter. Drop into hot oil and fry till crisp and golden. The steam build inside will cook the potato. Thinner the slices, faster they will be cooked through. Mash boiled potatoes and stir fry them in a little oil with cumin seeds, turmeric, salt, chili powder and dry mango powder. Place the sliced bread on a plate and spread the spiced potato mix on it. Top with another slice to make a sandwich. Cut the sandwich diagonally criss cross to get 4 small trianles. Follow the basic procedure as mentioned above. Dip these triangles in batter and fry till golden and crisp.